The secondary heart field is initially part of the cardiogenic field but does not differentiate as myocardium until the looping stage of heart development. 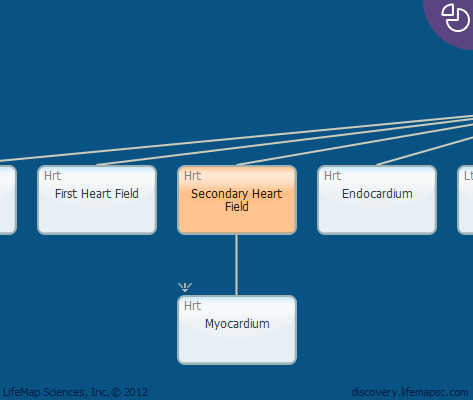 The secondary heart field gives rise to the last myocardium to be added to the outflow tract and is located most caudally and medially in the heart field. The second heart field consists of the progenitors that are added to the formed heart tube at either the arterial or venous pole. The secondary heart field refers to the splanchnic mesoderm caudal to the outflow tract. It constitutes a source of cells that gives rise to both the most distal outflow tract myocardium and the most proximal smooth muscle that forms the tunica media of the arterial trunks. This myocardium and smooth muscle make up the definitive arterial pole The secondary heart field should be restricted from differentiating too early; failure to maintain an undifferentiated secondary heart field progenitor population brings to premature addition of these cells to the heart tube. In such situations, the inadequate progenitor cells build a faulty arterial pole. Reduced migration or abnormal proliferation in the secondary heart field leads to outflow tract defects.